You know I'm a sucker for a good picture book. We have no shortage of books in our house, and I love sharing new stories with the kids as often as I can find them. 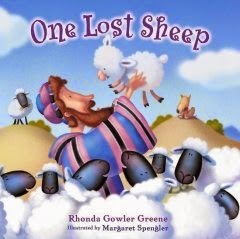 One of our latest finds is One Lost Sheep, written by Rhonda Gowler Greene and illustrated by Margaret Spengler. This little storybook features Jesus' parable of the lost sheep in a writing style that's perfect for little ones to understand. Lincoln and Addie both ask to read this book and their concern for the little lost lamb is just as real as that of the shepherd! The rhyming text and the simple phrasing (not too many words on a page) make it an easy read for parents and young readers alike. Addie is especially fond of shouting "Baa! Baa!" every time we turn a page and she spots more sheep. The book is aimed at ages 4-8, but both of my preschoolers still enjoy it and seem to understand the story. As they grow older, we will definitely reference this book when learning the parable in Luke 15!